Ever since Codemasters revitalised the F1 gaming scene with their officially sanctioned series back in 2009, Christine and I have been largely excluded from participation. We did manage to get our hands on F1 2009 for the iPhone, but since then we've found ourselves largely bereft of big screen distraction, with Codemasters limiting their releases to PC, PlayStation and Xbox platforms. 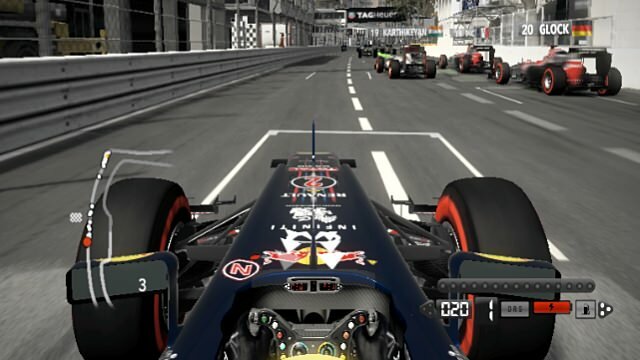 Things are looking up this year however as Feral Interactive have just brought F1 2012 to the Mac! For the first time in over ten years an official Formula One title is available on Mac platform and you can download it instantly from the Mac App Store. In the UK the game will set you back a cool £34.99 and weighs in at just under the 8 GB for the entire download. It's also worth mentioning the hardware requirements are predictably high for a game featuring such glorious and fast moving gameplay. For the ultimate cockpit experience a dedicated graphics card is recommended, meaning something like a Macbook Pro or the new iMac will be the order of the day. Now that the two of us can join in the fun we'll grab a copy and have a play around. If you're an F1 fan and Mac owner you owe it to yourself to do the same, and it probably wouldn't hurt if you encouraged Codemasters to consider porting F1 Race Stars over too. We'll let you know how we get on once we've mastered that pesky straight-line test.